English Gothic is the name of the architectural style that flourished in England from about 1180 until about 1520. Many of the largest and finest works of English architecture, notably the medieval cathedrals of England are largely built in the Gothic style. So also are castles, palaces, great houses, universities, and many smaller unpretentious secular buildings, including almshouses and trade halls. 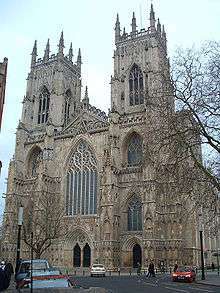 Another important group of Gothic buildings in England are the parish churches, which, like the medieval cathedrals, are often of earlier, Norman foundation. Early English architecture is typical of many Cistercian abbeys (both in Britain and France), such as Whitby Abbey and Rievaulx Abbey in Yorkshire. Salisbury Cathedral is a superb example of the style; because it was built over a relatively short period (the main body between 1220 and 1258), it is relatively unmixed with other styles (except for its façade and famous tower and spire, which date from the 14th century). Other good examples are the Galilee porch at Ely Cathedral; the nave and transept of Wells Cathedral (1225—1240); the west front of Peterborough Cathedral; and Beverley Minster and the south transept at York. The style has also been used in academic buildings, such as the old library of Merton College, Oxford, which constitutes a portion of the so-called "Mob Quad." The Perpendicular style began to emerge c. 1350. Harvey (1978) puts the earliest example of a fully formed Perpendicular style at the chapter house of Old St Paul's Cathedral, built by William Ramsey in 1332. It developed from the Decorated style of the late 13th century and early 14th century, and lasted into the mid-16th century. It began under the royal architects William Ramsey and John Sponlee, and fully developed in the prolific works of Henry Yevele and William Wynford. In the later examples of the Decorated Period the omission of the circles in the tracery of windows had led to the employment of curves of double curvature which developed into flamboyant tracery: the introduction of the perpendicular lines was a reaction in the contrary direction. The style grew out of the shadow of the Black Death which killed about a third of England's population in 18 months between June 1348 and December 1349 and returned in 1361–62 to kill another fifth. This had a great effect on the arts and culture, which took a decidedly morbid and pessimistic direction. It can be argued that Perpendicular architecture reveals a populace affected by overwhelming shock and grief, focusing on death and despair, and no longer able to justify previous flamboyance or jubilation present in the Decorated style. The style was affected by the labour shortages caused by the plague as architects designed less elaborately to cope. Some of the finest features of this period are the magnificent timber roofs; hammerbeam roofs, such as those of Westminster Hall (1395), Christ Church, Oxford, and Crosby Hall, appeared for the first time. 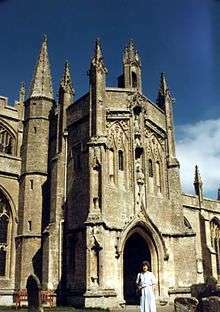 In areas of Southern England using flint architecture, elaborate flushwork decoration in flint and ashlar was used, especially in the wool churches of East Anglia. 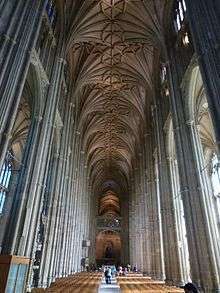 Some of the earliest examples of the Perpendicular Period, dating from 1360, are found at Gloucester Cathedral, where the masons of the cathedral seemed to be far in advance of those in other towns; the fan-vaulting in the cloisters is particularly fine. Perpendicular additions and repairs can be found in smaller churches and chapels throughout England, of a common level of technical ability which lack the decoration of earlier stonemasonry at their sites, so can be used for school field trips seeking evidence of the social effects of the plagues. Notable later examples include Bath Abbey (c. 1501 – c. 1537, although heavily restored in the 1860s), Henry VII's Lady Chapel at Westminster Abbey (1503–1519), and the towers at St Giles' Church, Wrexham, and St Mary Magdalene, Taunton (1503–1508). ↑ Sharpe, Edmund (1871). The Seven Periods of English Architecture Defined and Illustrated. ↑ Frankl, Paul (2000). Gothic Architecture. Yale: Yale University Press. p. 193. 1 2 Harvey, John (1978). The Perpendicular Style. Batsford. This article incorporates text from a publication now in the public domain: Chisholm, Hugh, ed. (1911). "Decorated Period". Encyclopædia Britannica. 7 (11th ed.). Cambridge University Press. p. 915.